It has been a while since I've posted my meal plan for the week but after visiting a friend I used to cook with in Pensacola (and her weekly menu text messages) I found the motivation to track of our meals again. Soon I won't need to think up a new menu and just click on a recipe. Here is what we'll be eating this week. 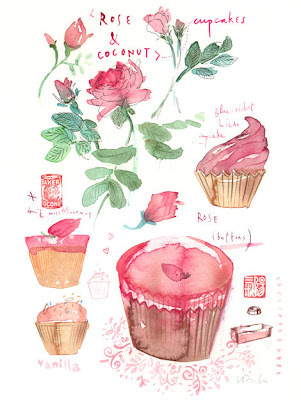 As for desserts, I just may have to make some Rose and Coconut Cupcakes. The illustration above is divine!